Reaching optimal performance for all athletes in the most efficient manner must remain a top priority for all performance coaches. This goal is exceeded in importance only by reducing injury during competition. Even with the inclusion of injury reduction training tactics, which are commonly congruent with many desired training adaptations, the use of efficient training methods to gain and maintain optimal performance enhancements are vital for successful athletic performance. Coaches must also realize the perfect training model for athletes only exists in theory and there are never absolute outcomes with the use of various training methods. This is due to the dynamic systems theory and the understanding that all systems of the body, along with their reactions to each stressor would need to be accounted for in a real-time setting for the “perfect training model” to be executed. We, as performance coaches, must deal with athletes’ external stressors such as tests, personal lives, jobs, and even occasionally misguided practice techniques. Even though the perfect training model only exists in completely controlled and understood world, an attempt is made by all coaches to create the ideal model. Before efficient manners of training can be discussed and argued it is important for all coaches to first have a firm understanding of the meaning of “optimal performance”. Optimal performance can only be achieved when all qualities, or parameters, used within the event are peaked simultaneously, to their appropriate amount for each competition event. The peaking of these parameters relies on each of their individual responses to training, which determines their windows of availability for use in competition. The importance of each of these individual qualities varies depending on the requirements of each sport. However, sports will commonly include the adaptations to parameters in the aerobic system, maximum strength levels, anaerobic endurance or repeat sprint effort, and maximal speed. As stated previously, a coaches understanding of each event and its specific quality requirements of that event will determine the specific training protocol utilized. There are many known periodization models that have been used throughout the training process. Two of the well-known periodization methods are the block and conjugate models, which will be compared in this article. Both are common practices used within the strength and conditioning world and have their own respective benefits. For those unfamiliar with the differences between the two, block training places a highly specific stress on one of the above mentioned qualities, while conjugate training stresses all qualities within a training cycle. It should be noted here that even when the focus of adaptation is placed on a single quality, as seen in block training, other parameters may be affected due to the training. An example of this occurs when seventy or more high-quality repetitions of 10 seconds or less are completed in a training session, yet a significant aerobic training effect was seen. The block training model can be broken into simple components, such as the three specialized phases termed accumulation, transmutation, and realization. However, this model is much more complex when considering the multi-year training model remodeling, which must match the adaptations made by each athlete. Each phase is designed to build upon the adaptations from the previous and ultimately lead to peaking of all abilities. Accumulation is programmed for the development of basic abilities such as aerobic endurance, muscular strength, and general movement patterns. This phase of training will be completed for the longest amount of time as the desired physiological and morphological changes develop the most slowly. These general adaptations are then built upon in the transmutation phase of training in which anaerobic endurance and specialized muscular endurance training takes place. Finally the realization phase is designed as a pre-competitive training phase in which maximal speed and the nervous system are maximized. It is clear these three phases function on a continuum which begins with the most general adaptations occurring in the accumulation phase and becoming more specific as training progresses through the transmutation and finally the realization, or peaking phase. The block training method further functions on the systematic principles of residual effects, which are based on the amount of time each quality remains in a highly-trained state once training is ceased. This builds on the previous idea that once one parameter is maximized, others can be specifically trained while maintain the adaptations to the previously trained qualities. The knowledge of these training residuals allows for a systematic training of each individual quality, along with the peaking of all qualities simultaneously, which must be the goal for all coaches prior to the competition phase of the annual cycle. Based on the residual effects shown above, aerobic qualities and maximum strength maintain their training effects the longest, while the nervous system, or max speed, have the shortest residuals. It is for this reason aerobic and maximum strength abilities are trained during the accumulation phase, or early in the annual cycle. By stressing and adapting these qualities with longer residuals, the qualities more specific to sport, such as maximal speed, can be improved while the aerobic and strength qualities remain elevated due to their long residual effects. Transfer of training is also improved as more specific training is completed prior to competition, which is also in accordance with the three block training phases. Coaches must understand the importance previous training plays in regards to determining the length of time each quality is stressed. The individual athlete responses to training must be considered at all times, as these will ultimately determine the residual length windows, and thus the optimal results of block periodization can be reached. The conjugate training model takes a different approach as it attempts to train all qualities within a single phase or training session. The majority of conjugate training models follow a similar training session, which begins with maximum strength training, followed by a lighter exercise which is aimed at increasing power and velocity, and then finish with some exercises aimed at improving work capacity, or anaerobic endurance. This model leads to inefficient adaptations and reduced quality of work as the athlete’s body can become confused by the multiple signals being sent as it is being told to be fast, strong, and increase duration all within the same training session. It is important to understand that this method will lead to performance improvements. However, some adaptations will occur at a much slower rate when multiple stressors are presented within the same cycle. This is due to the fact that not all parameters require the same amount of time to adapt maximally. If one of these qualities adapts at a faster rate than others then that one ability will be maximized. However, the others will lag behind and optimal performance will not be reached in a time efficient manner. Some adaptations occur more quickly than others, which means they are being trained unnecessarily while other qualities are trained with sub-optimal stress levels. This can lead to the continued training of a quality that may already be adapted optimally and will remain adapted due to its residual training effect. This inefficient and elongated adaptation phase leads to an excessive amount of time spent in the preparation phase, which eliminates the ability to execute multiple realization, or peaking, cycles within the annual training cycle. In the realm of collegiate and professional athletics, the majority of athletes must reach the stage of optimal performance specific for their individual event multiple times within the annual cycle. Using the idea that optimizing all abilities simultaneously will lead to the greatest chance of a successful performance, specific peaking programs can be created within the annual cycle. These peaking times can be used at any time throughout training, however, they are typically applied at specific phases. Examples of these peaking times are prior to training camps, the beginning of conference play, and post-season competition periods. Triphasic training takes full advantage of the block system and its benefits of peaking athletes at specific times of the competition calendar. The three phases of the block model can be clearly seen with the above 80% training block, the high-velocity high-load block, and the high-velocity low-load block. The residual effects of each quality are also taken into account, which becomes clear when the entire training calendar is laid out. Before the focus of a specific block can be chosen within the training cycle a coach must first determine the competition dates. The knowledge of when athletes must be peaked will allow a coach to set up a plan that will complete all phases of training within the allotted time frame. Once these dates are determined, the duration of each block must be determined. The needs of each athlete must be considered during this planning of each phase. Some athletes will require different stressors due to sport requirements, prior training status, genetics, etc. it is important all of these factors are understood before a program is finalized. 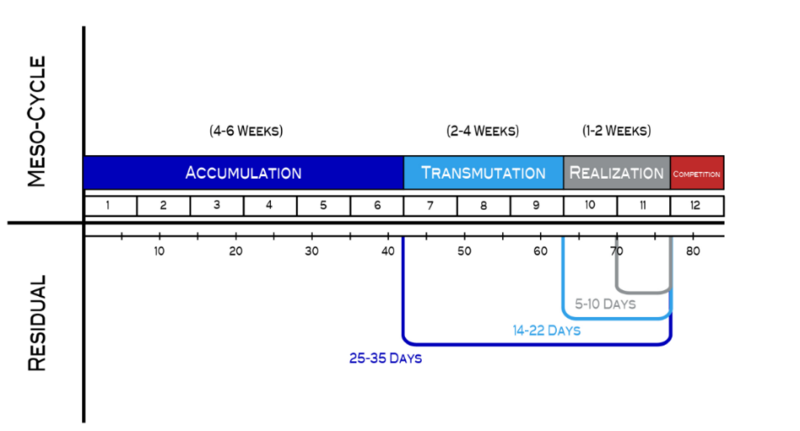 The phases of the block training model, as described previously, include the accumulation, transmutation, and realization stages. Within the Triphasic Training model, the accumulation block consists of the GPP training blocks and the muscle action training at above 80% of one rep max. These two training blocks are aimed at increasing the aerobic capacity and energy systems of the organism and improving maximal strength. These two qualities are very general and non-specific to sport, but they are responsible for creating the foundation upon which all other abilities are able to be built. When the long residual effects of these two qualities (aerobic and maximal strength) are considered, it is clear these abilities are able to be trained, and then maintained for an extended period of time. As stated above, the retention of these qualities allows other parameters such as anaerobic endurance and maximal speed to be trained, ultimately leading to all qualities peaking simultaneously. Due to the physiological adaptations occurring in the body and these qualities building the foundation for others, the greatest amount of time is spent in this accumulation phase. During the transmutation phase of block training anaerobic endurance, or the ability to repeat high intensity bouts, is trained specifically. Based on the continuum of residual effects training this quality becomes ideal. This phase becomes more specific to sport as energy systems required for competition can be trained more specifically now that a solid foundation has been built. Biometric training, as seen in Triphasic Training, can be completed in this phase to ensure all athletes receive the appropriate stimulus, which also continues to reinforce the previous training completed on the aerobic system. Training percentages are also lowered during this time as power, rather than maximum strength, is now the focus of training. The reduction in percentage also makes training more specific to sport as bar speed is increased. Finally the realization phase occurs just prior to competition and consists of maximal speed training. This block is executed using lighter-loads, less than 55% of one rep max, at high-velocities. This training is more specific to sport as it most closely mimics the velocities seen throughout competition. The effects of this nervous system training are the shortest, thus this quality must be trained immediately prior to competition. The picture below depicts the ability of the block training model to peak all qualities simultaneously, ultimately leading to maximized ability to compete and perform. The adaptations of training the aerobic system and maximum strength early in the cycle do not diminish for up to 35 days, especially if the qualities are “touched up” throughout that residual time period. The transmutation phase effects will remain for up to 22 days, which allows the realization phase to take place while remaining adapted. Ultimately, all qualities for the desired competition event can be trained, adapt, and supercompensate simultaneously when the block model is programmed correctly. This will lead to the greatest opportunity for a successful competition.